Movies about older people are becoming more and more common as a certain population segment finds themselves aging. 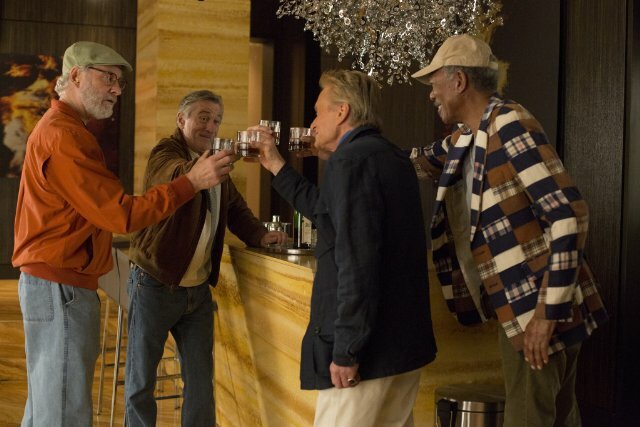 “Last Vegas” is the latest of this genre, a blend of jokes about aging and mild introspection about how older people should live. Like others before it, it has a fabulous cast and some good dialog, and succeeds at what it sets out to do. It’s not “Citizen Kane,” but it’s not trying to be. This is a movie to see if you want some laughs and don’t mind if the comedy is a bit broad at times. Billy (Michael Douglas), Paddy (Robert De Niro), Archie (Morgan Freeman) and Sam (Kevin Kline) have been friends since they were children. Now they’re all pushing seventy, Archie has moved in with his son after having a stroke, Paddy is still grieving his late wife, and Sam is starting to freak out at how his and his wife’s retirement in Florida is going. Billy, meanwhile, is rich and single and doing his best to live the life of a thirty-year-old. When he proposes to his thirty-two year old girlfriend, Archie and Sam decide to get the gang back together for a bachelor party in Las Vegas. Paddy has to be tricked into coming, as he and Billy have bad blood between them, but soon the foursome are back together. The four central actors have good chemistry together, and look to be having a lot of fun. Sam’s wife has given him permission to sleep with someone else while in Vegas, so Kline has plenty of opportunities to use his gift for comedic timing. Douglas is solid in a role that requires both bravado and pathos, and his scenes playing off De Niro enable both actors to demonstrate their gifts for blending comedy and drama. Freeman is iconic as ever as the solid center around which the group friendship revolves. Archie is handling his aging better than anybody else in the film, including his son (a bundle of concern played well by Michael Ealy). There isn’t a lot that stands out either positively or negatively in “Last Vegas.” It’s good but not great, funny but not hilarious, clever but not brilliant. It’s also not terrible – for one thing, a potentially offensive and terrible situation (Sam hitting on someone who turns out to be a drag queen) is handled with a great deal of humor and poise. There’s some juvenile humor, but nothing awful. This is a film that treads lightly and walks down the middle of the road. If you’re just looking for an amusing way to spend a couple of hours, you could do a lot worse than seeing “Last Vegas.” If you’re a fan of any of the main actors, it’s a must-see, but otherwise it’s not particularly striking either way.